Holotable 0.9.2 (along with Holodeck 0.3.8) is now available from the automatic updater (downloads section files to come soon). Usability changes in Holotable include allowing multiple cards to be selected and pulled in pile search dialogs, 'target'ed cards temporarily highlight, and a popup for the tally command shows the number of cards in the stack. This version fixes a problem with missed messaging from the opponent about manual card movements that occurred immediately after shortcut/command key pile movement. Holodeck received the ability to select (and manipulate) multiple cards in the deck list. This means you can add copies of cards, delete copies of cards, and increment/decrement the number of starting copies for multiple cards at once. kryptofis has collected a number of decks from players to share with folks who might be returning to the game and could use some beyond-the-basics decks to play with/learn from. Check the downloads page to get it. Holotable 0.9.1 (along with Holodeck 0.3.7) is now available from the downloads section. Usability changes in Holotable include the ability to cycle through fan spacings for a stack by using the Control key in conjunction with the fan key and place cards under the starting cards pile using the , (comma) key. Also fixed was a card context menu problem that resulted in cards "jumping" when clicking on the table to cancel the menu. Holodeck received the ability to increment/decrement the number of copies of a card marked as starting; this is done using the 's' and 'r' keys, respectively. A bug that zeroed the starting card count when a previously-saved deck was loaded has been fixed. The average destiny dialog was changed to provide information about the distribution of each destiny (0-7 and other); this uses the cards in the deck not marked as starting, and cards with multiple destiny numbers have the higher destiny used for the counts. Holotable 0.8.6 is now available from the downloads section. It has several bugfixes. A large number of potential jumping card conditions have been removed. A problem with saved games which could crash the program has been fixed. A complicated problem with pile search and verify dialogs which would crash the program has been fixed as well. Holotable 0.8.5 and Holodeck 0.3.4 are now available from the downloads section. Holotable 0.8.5 has the capability to automatically update image files (optional). This is very similar to the CDF and program update capability from 0.8.4. Additionally, the pile search dialog card list comes up in pile order; that is, the top card in the pile is at the top of the card list. The list can be sorted alphabetically by clicking on the column header. A long-standing bug where some people would see cards jump across the table has been fixed. Holodeck 0.3.4 allows the user to create random decks. The sets used as the card pool are selectable. All cards have the same weight when being selected. If you have 0.8.4 set for trying to download program updates, it's not going to work. It will download the file and then fail to execute it. Apparently I screwed something up in the 0.8.4 code after testing it with the program update function. It appears that the GTK call doesn't work as it should. Anyway, you ought to have a file "ht_temp.exe" in your Holotable install directory after that fails. You can manually run that and get the new versions (it's a normal installer). Alternatively, you can download the update from the Holotable website. I modified (and tested) 0.8.5 so that it should be able to do program updates correctly in the future. I guess we'll have to see what really happens when the time comes. Thanks to MAVanDriel, Accolon, and JediJer for their testing help. Some image updates (available through 0.8.5) are courtesy of Crickett. Holotable 0.8.4 and Holodeck 0.3.3 are now available from the downloads section. Enjoy! The preview cards from Virtual Set 18 are now available. Thanks to Mark VanDriel for his work on this. How to enter: Email me at psychobabbleswccg@gmail.com. Once I have got your email I will reply to confirm your entry and provide you with a copy of the online tournament guide. You must register before Thursday 24th July (US EST) so I am able to do round matchups and notify everyone. Registration is now open for the first ever online cube tournament, run by the Online Tournament Committee. Tom Hollingworth (WiseMarsellus) will be the Tournament Director. To register, send an email expressing interest and your choice of pod (see below) to hollingt@bc.edu. Registration will extend until 6 PM Friday, May 23rd. There will be no cost for registration. The Cube is the PC's way of bringing sealed deck to SWCCG. The cards in the cube have been selected to create a balanced and enjoyable draft experience for all players. More detail about the cube can be found here. The draft will happen in real time over AIM. Each player drafts in groups of up to 5 players of the same side. Random 9 card 'packs' will be generated and sent to each participant in the tournament who will then draft a card and send the remaining cards on to the next player. Once the first pack is exhausted, it will be done again until 5 packs have been drafted and each player has 45 cards. Players will then build a 40 card deck from these cards and from the 13 fixed locations available for their side. In order to ensure there is no cheating, players will then send their completed draft sheets in an email to the tournament director. Drafting will take place in live pods via AIM. The tournament will have two draft pods, one beginning at Saturday, May 24th 2200 GMT and the other beginning at Sunday, May 25th 1200 GMT. Please allow for a maximum of 2 hours for drafting. If you cannot make either of the pods email Tom with a time that you can make and he will try to match you into a pod. Players will then play a 4 round swiss tournament with their decks, with each round extending from Monday until 10 PM Sunday. All games must be played on holotable. Results should be communicated to the TD by emailing hollingt@bc.edu. Pairings will be posted on the PC forums every week by 10 AM Monday. There are several fixes on the Interim Updates page. They provide fixes for the Virtual Set 13 small images of sites that are rotated incorrectly and the (very old) errata of Oh, Switch Off. Also, the three Defensive Shields that were virtualized to include a grabber icon are also available. Holotable 0.8.2 and Virtual Set 13 updates (plus current errata and Virtual Set 14 preview cards) are now available. Thanks to Psychobabble for providing the card updates. Holotable 0.8.2 includes some better functionality for card groups, automatic version check on startup (optional), support for PNG images, and notification when an objective is flipped. Apologies for having been out of touch for the past many months. Real life has taken priority. As you can see at this point, we've completed switching our hosting over to TheForce.net. Many thanks to them for hosting the website and our game server. Please note that the "official" central game server is now located at www.holotable.com, so you should fix your Server IP address field of the Options dialog (Connectivity tab) in Holotable. Holotable 0.8.1 and Holodeck 0.3.2 are now available. They provide some nice updates I think folks will like (many of them have been specifically requested by users). Enjoy! 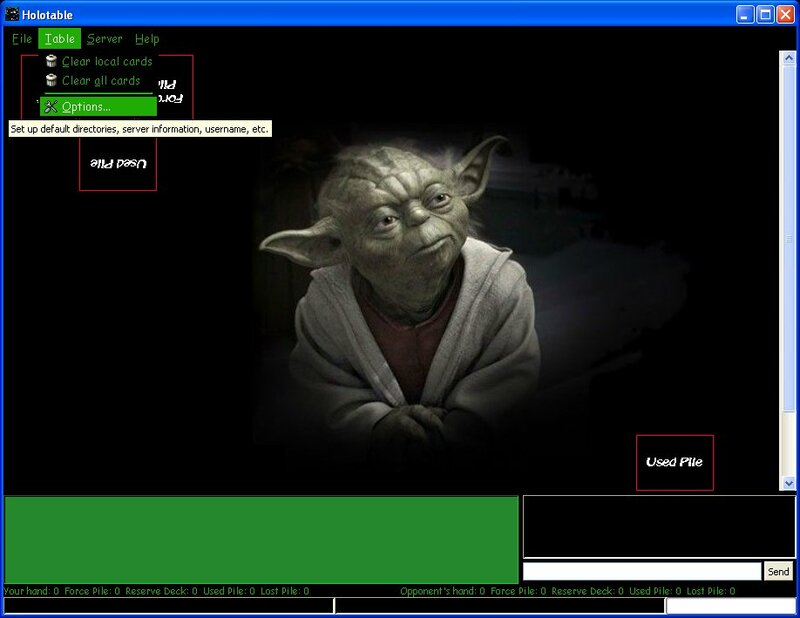 At some point in the next couple of days, this site and the game server will move to hosting by TheForce.net. This should improve our uptime and prevent the sort of long outages we've experienced twice in the last year. We also should have access to more resources as a result of theforce.net's support of SWCCG. A side effect of this change will be that the IP address for the server is no longer important in and of itself: all pages on this site will be relative to "www.holotable.com" instead of "<IP address>/holotable" (so update any bookmarks you have!). Also, you should be able to use "www.holotable.com" in the Server IP address field of the Options dialog (Connectivity tab) in Holotable. It should be obvious when the new hosting is in effect. Be on the alert for switching game server IPs once you see that things have switched over. As something of an "extra bonus", Holotable 0.8.1 and Holodeck 0.3.2 will be available for download from the site after the switch. Holotable 0.8.1 has a number of usability improvements, the most obvious of which are a convenience function for initiating Force drains at locations and being able to toggle between large image popups and card text tooltips on the fly without affecting your default setting. Holodeck 0.3.2 contains some long-awaited upgrades: multiple-character "jump to card" support (replacing the ability to jump to the first card in the from list that started with a given character), a view of your deck that has the ability to sort by column, a card summary display for your deck (gives number of cards of given types), and support for quick reordering of your deck load order by selecting a card and using CTRL plus the up/down arrow keys. I've posted new large (and small, for Linux) image installers that are updated through Virtual Set 12. This will make it simpler for people to get the latest images. If you already have the images, please don't download the large image installers -- they're about 240 MB, and that puts a lot of stress on the connection. This is more for people who are starting from scratch. Thanks. Again with many thanks to Psychobabble, you can now download the Virtual Set 12 images and CDFs. There's no way I would have gotten the updates done by myself anytime soon. So let him know how grateful you are for the HOURS he spent on this and the re-edit. He actually got them to me two days ago (very quick! ), but my Internet was down all yesterday, so I couldn't make things available until today. I will be creating a new large image installer that includes updates through V12. This will keep people starting from scratch from having to download 4 image installers to have everything up to date. With many thanks to Psychobabble, you can now download the virtual card re-edit images. The installer also includes a copy of the CDFs (with a fix for switched Gold Leader in Gold 1 text that was in the Holotable 0.8.0 installers) for the re-edit. Look for Virtual Set 12 updates to come sometime in the days ahead. Holotable 0.8.0 is now available. It adds several new features, such as controls for changing phases (coordinated between the players) and pausing the game, country selection for display in the central server dialog, the ability to put the chat/log area in a separate window, additional commands in the card context menu, and "keepalive" messages that prevent some routers from automatically shutting down connections when there hasn't been other network traffic for a while. Additionally, your password is now hashed before sending it to the central server when you log on; this keeps your password more secure. Finally, there were two bugs: custom key bindings for searching piles would not work, and fanning a stack could result in cards moving outside the table area. These are fixed. Also included in the new version are card text updates for the virtual card re-edit. Images will be fixed at some point -- if the PC's card database gets its images updated soon, I will use those. Otherwise, I don't know when I might have time to do them. Please volunteer if you'd like to help. Please note that the game server on port 5320 (the main one) is now set up to work only with Holotable 0.8.0. If you try to log on with an earlier version, you will fail to authenticate (because the server is no longer accepting plain-text passwords). The server gives a message indicating that version 0.8.0 is required. The game server on port 7935 will be available for games between players using non-0.8.0 versions for a few weeks. Holotable 0.7.4 is now available. It has user-configurable key bindings, which should please many of you. The file keybindings.ini sets up the bindings, and you can return to the default setup by using the button in the Initialization tab of the Options dialog. Also, the key reference dialog (available under the Help menu) changes based on what you've set your key bindings to be, so as you transition to a custom setup, it will still help you. Note that any of the keys that are menu item accelerators (i.e., are listed beside menu items like "Ctrl-L" for load) cannot be used as the key binding for rotation or flip commands. This is because those commands also use the Control key to detect whether or not to rotate or flip the whole stack. If you try to set something like that up, you'll get a warning and the default setup will be used. So, basically, don't use l, o, s, q, or z for those commands. Also in the update are some fixes for problems with cards snapping to incorrect locations for piles and not being able to fan or look through stacks while in hand. We're finally back up after 6 weeks of downtime. Really sorry about that, guys. The server got fried in a lightning storm at the end of July, and a number of things have combined to make the comeback very slow indeed. But things are working again. You'll find that Holotable 0.7.3 is now available. It includes the ability to group cards so you don't have to move associated ones like stacks anymore. However, it's not terribly advanced, so make sure you destroy groups before you try to move any of the cards in them to piles, etc. Also, there is more advanced reporting available; this tells you when your opponent moves cards to and from piles, flips cards on piles, etc. It won't work entirely correctly if your opponent is not using 0.7.3, however, so don't rely on what it says unless that's the case. See the readme file for details on how to use the new features. I'll be updating the website with more downloads and such, possibly tonight and tomorrow. Look for full redux images (thanks to Psychobabble) and updates to documentation, etc. Oh yeah, and the game server has returned on port 5320. Hit "Restore defaults" in the Connectivity tab of Holotable's options to get the setup easily. The virtual card redux is finally available as updated CDF files. You can get them in a .zip from the Interim Updates page. The new images will be coming at some point, but don't hold your breath, since there are almost 50 cards to do. I had hoped to release version 0.7.3 of Holotable along with the redux, but I haven't had time to do much and get things tested. So it will have to wait. The newly-errataed virtual cards have updated images on the Interim Updates page. You may download the .zip file there, as well as a slightly-changed version of the Holotable 0.7.2 executable that won't draw over part of the text on the left border of the card. Some other new features: press 'm' to "target" a card (similar to "using" a card), the ability to choose the fan amount (small, medium, or large), and a quick command bar to supplement the pile and search commands previously available only with key presses. Also, a bug relating to undoing several types of actions, which was introduced in 0.7.1, has been fixed. Also, now clicking on empty areas in your hand or the table removes focus from the chat text field so that you can use key commands again (instead of the key presses going to the chat text field). Additionally, the virtual card errata recently released by the PC are included in the updated CDF files. Updated images for those cards are to come sometime soon. Hopefully this new stuff will sort of make up for the website and game server being down all last week. Enjoy! It's been a while, but Holotable 0.7.1 and Holodeck 0.3.1 are now available. Holotable only has a few changes: you have the option of loading cards to your hand (like pre-0.7.0) or your Reserve Deck, and you can use the 'B' (capital b) key to move a card from the top of Reserve Deck to your Used Pile (facedown). The 'B' key is to help make things faster when drawing destinies. Holodeck 0.3.1 has a few features/additions. You can select basic or advanced search (basic search makes the window smaller for those of you with limited screen space), see card type in the "cards to choose from" list, use keyboard shortcuts for the Search and Clear buttons, and cycle through cards that start with a letter by continually pressing the corresponding key. Holotable 0.7.0 and Holodeck 0.3.0 are now available. Holotable mainly improves the undo/redo functions so that more things are supported (flipping, rotation, straightening/fanning, etc.). There are some other changes as well, like being able to draw destiny with the 'b' key and cards loading to the Reserve Deck instead of the hand (since you can specify which cards are starting ones). Holotable 0.7.0 should not be used with earlier versions. Holodeck 0.3.0 gives much expanded search capabilities for deckbuilding. The lore and gametext can be searched separately and there are many more options for searching numerical values like power, deploy, ability, etc. Holotable 0.6.4 is now available. It fixes a few bugs that have been causing intermittment crashes for people. Particularly, the fixes are for crashes when using the 'q' key and when drawing cards into hand with 'd' or 'w'. There's also the capability to hide the card searched for and pulled from a pile. I plan to make the main server (on port 5320) into an authenticated server when Holotable 0.7.0 comes out. I have no timeline for this right now, but there will be a number of changes that break backwards compatibility, so it's as good a time as any. At that point, no one will be able to impersonate anyone else anymore. Holotable 0.6.3 is now available. It adds the capability to authenticate with the central server (so that people cannot impersonate others). The server on port 7935 currently runs authenticated. Sometime in the future, the server on 5320 will also be converted to requiring authentication. You must use your username and password from the forums in order to log on. Other changes in this version are a fix for a bug in the network code and CDF updates. Holotable 0.6.2 is now available. It fixes two bugs with the undo and redo functions and identifies which pile is shuffled (to you and your opponent) when you shuffle the Force Pile, Reserve Deck, Used Pile, or Lost Pile. 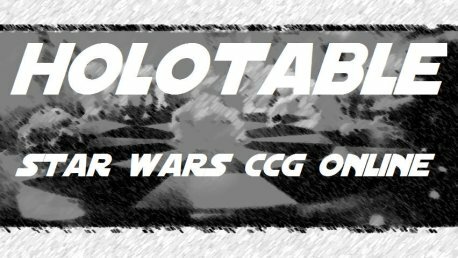 Psychobabble has put together a deck pack that new players (or returning ones) can use to get a quick start playing SWCCG. It contains 4 decks for each side of the Force and has a short description of how to play each deck. You can get the deck pack from the Downloads & Links page. Look for the heading "Deck Pack". Holotable 0.6.1 is now available. Several new features have been added, perhaps the most important of which is the ability to undo/redo card movements (up to 64 are saved). The movements are "remembered" based on a single click and drag, so movement of a stack only fills one slot in the undo list. In a similar fashion, all pile movements are also remembered together (in the same way they are reported), so if you see "You activated 5 Force", using the undo function will un-activate 5 Force at once. Another useful feature is the ability to load cards to the starting cards pile; the starting cards are designated in Holodeck (see below). The pile search capability was added to the Force Pile, Used Pile, and Lost Pile. Some other improvements/additions are the ability to ensure that all cards are flipped the same way and a listbox of commonly-sent messages to speed gameplay (replaces the "Acknowledge" button). The piles are now anchorable on a per-pile basis, instead of all one way or the other. This makes having piles on separate sides of the table work more sensibly. Pile search dialogs now will show a tooltip containing the text of the selected card; this helps with searching a deck for a card that matches certain criteria (as opposed to searching for a particular card just by title). Finally, a few bugs that caused crashes in 0.6.0 were fixed. The problems with pressing 'q' over a facedown card and pressing OK in the pile search dialog without having selected a card are both fixed. Note: Holotable 0.6.1 CANNOT be used with earlier versions. This is due to the addition of pile search features and undo/redo functionality. Holodeck 0.2.1 comes with the Holotable 0.6.1 update. It supports indicating how many of a particular card you want loaded to the starting cards pile. Since this changes the file format slightly, the default extension for saved decks is now ".htd"; you will still be able to save and load decks saved as ".ctd". Another added feature is that destiny number is an option when searching for cards. A new "Deck" menu was added. From it, you can choose to calculate your deck's average destiny (excluding the cards that are set to be starting cards). You can also simulate your opening draw. Holodeck will internally randomize the non-starting cards and "draw" the top eight, displaying the results in a dialog box. Holotable 0.6.0 is released! This version adds starting cards and out of play piles (like the normal Force Pile, Reserve Deck, etc.). Also, you can now search the Reserve Deck or starting cards pile for a particular card by name. If you're connected to an opponent, your opponent must first approve the search. A few features were added to increase the speed of games. The first is an "Acknowledge" button, which sends a message telling your opponent you acknowledge their last message; this can be used instead of having to click in the chat entry field, type "OK", and send the message. The second feature to make games faster is a key that sends a message saying "I'm using <card title>". Additionally, the stack counts change to red for a short period of time when the count itself changes; this will help people see when their opponent does something regarding a pile and hopefully will discourage cheating. Finally, a few bugs were found and fixed. Remember to report problems and make suggestions for new features in the forums. I won't know what people want if I don't hear anything. Enjoy! Note: Holotable 0.6.0 CANNOT be used with earlier versions. Holodeck 0.2.0 comes with Holotable 0.6.0. It adds the ability to search for cards by words in card the title and/or by words in the lore/gametext. It also allows you to filter cards by set, a feature that was tantalizingly disabled for the first year of Holodeck's existence. You can also choose "All" for both card type (this selection wasn't available before) and card set. Finally, you can export your deck to a plain text listing of the cards (and how many of them there are). Holotable 0.5.5 is released. It fixes a fairly major bug where cards can move to incorrect locations for the opponent when they are rotated. Linux version to come sometime in the next couple of days. The Virtual Set 11 card images are now available, as is Holotable 0.5.4. The new version adds the option of enabling context menus for cards/stacks, which can be used to do things like flip, shuffle, fan, etc. This time there is a full installer, so that anyone who's just starting to use Holotable can download that and have everything as up to date as possible. The large image set that includes everything through Virtual Set 11 is uploading now and will be available later tonight. This is for people that are starting from scratch; if you already have the other large images, just download the V11 Update in the Card Images section. Yesterday was the first anniversary of the initial release of Holotable (version 0.1.0). It's come a very long way since then. In that first version, there was no way to set the background image, there was no way to chat with your opponent, there were no large images, Holodeck didn't even exist, and lots of stuff didn't work right. I've enjoyed working on this little project this year. We'll see what sorts of improvements and additions can be made in 2006. Merry Christmas! Virtual Set 11 has been released by the Player's Committee, and the CDFs for Holotable have been updated. You can now get them with Holotable 0.5.3 update. There are a few improvements to the program as well. Images will be coming in the next few days. If you like, you can copy the small images from the original cards corresponding to the virtual ones to the appropriately named directory in order to get the little version to show up rather than a missing image icon. Thanks to the PC for providing the updated CDFs. Enjoy! The updated large images for the errataed virtual cards are available on the interim updates page. The small images have not been done yet; I will probably include the errataed cards (large and small) in the update for Virtual Set 11, so you can get them that way if you like. Holotable 0.5.2 is available. It should fix the problem that some people have seen where piles "jump" around the table. Thanks to Fluke Skywalker for pinpointing a way to make the problem occur repeatedly; with his information, I was able to figure out what was going on. Holotable 0.5.1 is available. It should fix the problem that some people have seen where recirculation does not work correctly for the opponent. It also adds intelligent reporting of cards being moved from pile to pile with the key commands. For example, five successive presses of the 'a' key are reported in the chat/log area as activation of 5 Force (instead of five separate "You activated 1 Force" messages). Updated CDFs are also included in the installer. Be sure not to use 0.5.1 with earlier versions. There are a few things that are incompatible, so you will see weird things happen if you do. The website and game servers are now back up after the ISP changed the IP address of the server machine (it's supposed to be static). Grrr. Anyway, things should be working again. You'll need to change the server IP address in your Holotable options if you use the central server to play. The new IP is 68.110.108.233. Hopefully it won't change again. Holotable 0.5.0 is released! This includes both Windows and Linux versions. This version, unlike the preliminary release, saves ALL card information to the file when saving a game. This includes the table size, both player's pile positions, and all cards, including the stacking order. This should make it easier for people to resume playing games if a crash occurs. A side effect of this is that all cards are cleared from the table when the correct password is entered to load the game. See readme.txt for a full list of fixes. Holodeck 0.1.5 is included in the installers. The changes are minor, but include a fix for a problem where large images could end up never going away, blocking the view of the rest of the program. Also, cards are prepended to the deck list now. This makes more sense from a deck building perspective, since the cards at the end of the list show up at the top of the stack when loaded in Holotable. This means that you can add your starting cards first, and they will be easily accessible when the deck is loaded. Also, you can more easily see the cards you added recently instead of the ones you added first. The Linux version of Holotable 0.5.0 prelim is now available. There is a new download category for Linux; it also includes card image downloads. For some reason, the download system wants to append ".tar" to the end of all the filenames. They are actually just *.tar.bz2 files, so you can cut off the extra when you save them. Linux users, please let it be known how things go with this version (but make sure to read the instructions in the installation section of readme-linux.txt). The download pages, online readme, and Holotable customization instructions should be up sometime later this week. I don't have time to do it right now. Holotable 0.5.0 is now available as a preliminary release. Just check out the updates download section to get it. I decided to make it 0.5.0 instead of 0.4.2 (as I had previously referred to it) because the new version can't be used with any previous versions. This is due to the password protection that is now present. When you start a game, both players are asked to provide a password. The password entered by your opponent will be included in the save game file if you decide to save the game. This means that (theoretically) only your opponent will be able to 'unlock' your game later (and likewise for your opponent). When you load a game, your opponent will be asked to provide the correct password; if he does not, the load will abort. Note that the load and save functionality will not work just for single-player testing of decks. Your saved game stores information about all your cards and their placement on the table, in your hand, and the opponent's hand. It also keeps the table size and pile positions, so these will be restored when your load the saved game. There are a few limitations, which may or may not be fixed at some point: the stacking order of your opponent's cards is not taken into account, and if you 'steal' an opponent's card, the card is not kept in your save file. This means that if you have overlapping cards, whoever loads their saved game last will have their cards on top. This generally shouldn't be a problem, but in the case of inserts or something of that sort where order of your opponent's card(s) within your Reserve Deck is important, you won't get the right result. There are several other bugfixes and other improvements, which are listed in the updated readme.txt file that you'll get with the installer. There was an error in the initial release of the Dark Side CDF - Vader's Anger (V) was still listed as a Used or Lost Interrupt in its text. It's now fixed. If you're one of the 8 or so people who got the incorrect version, please don't download again. Just change it yourself in the CDF if you want it to be right. Virtual Set 10 is now supported! Download and install the V10 Update, which is available on the right menu (or in the Card Images download category). The installer includes the large and small images and the updated CDF files. The large images make the installer somewhat big, so if you're on dialup and don't want to download all 1.6 MB, let me know. I'll create an installer that just has the new CDFs and the small V10 images. The corrected versions of Han's Heavy Blaster Pistol (V) and Leia (V) are available. These are fixes to the text that the PC made after the cards were created (or else old files were used in the first place). They are from Virtual Set 1 and 3, respectively. Holotable 0.4.2 is just around the corner; the main added feature is the ability to load and save decks. This will make online tournaments a more realistic possibility. I need some people to test it out to make sure things work correctly before it gets released. Email me if you'll have time in the next couple of weeks and want to help out. I also plan to release a Linux version when 0.4.2 comes out. If you're a Linux user and can help, please let me know. directory and overwrite the ones that were there. A Virtual Set 10 spoiler (one card) is posted in the Holotable Discussion forum. Check it out if you'd like. directory and overwrite the one that was there. As an update, I'm currently working on load/save game functionality. Things are going pretty well with it, and once it's done, Holotable should more or less be tournament-capable. A Linux version of Holotable is coming soon...I've just run into a few problems with it that need fixing. Holotable 0.4.1 is now available for download. If you already have Holotable version 0.4.0 or above, you can just download the Holotable 0.4.1 update and install that. If you don't have Holotable at all, just download Holotable 0.4.1 and you'll have what you need. Just remember that you have to download the large images separately if you want to use them. Holotable 0.4.1 fixes several leftover network problems from 0.4.0 and fixes some bugs related to moving large stacks of cards, rotation when a card is in a special pile, etc. 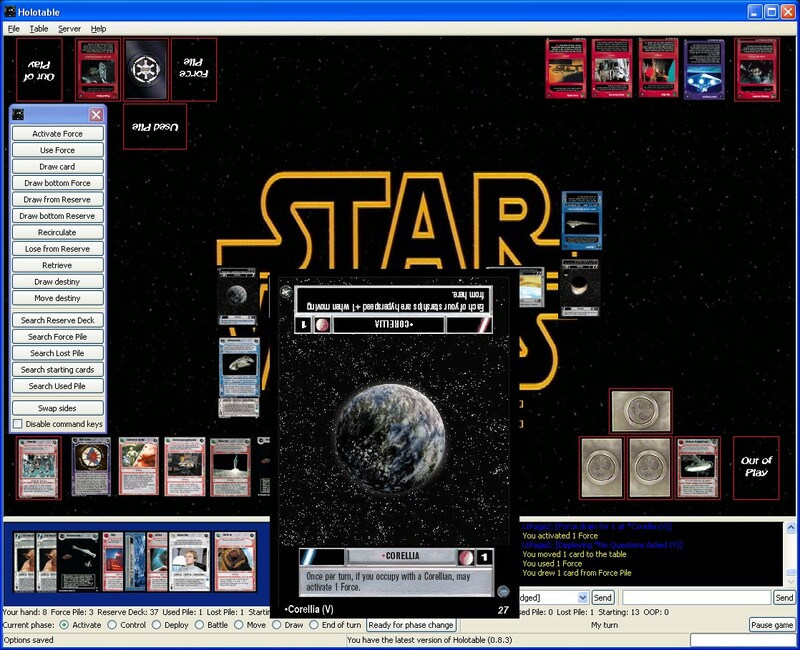 The added features are the ability to use keyboard shortcuts to activate Force ('a'), use Force ('u'), and lose from the top of the Reserve Deck ('l', cards are automatically flipped faceup if they were not already). Default pile positions can also be specified through the holotable.ini file, for those of you who don't want to be moving them to your preferred position all the time. Check the readme (which is also online) for details. A side effect of this default positioning is that pile positions are automatically sent to your opponent when you connect. Finally, there are a few minor things like less memory usage (large images are loaded as needed, then unloaded) and more messages in the chat log. The Holotable 0.4.1 installers also include Holodeck 0.1.4, which adds the ability to 'jump' to cards in the selection list by pressing the first letter of the card name. It will jump to the first card that starts with that letter, which will make it a little easier to navigate. Also, the arrow keys can be used to change the selected card in both the selection and deck lists. Previously, the arrow keys changed the card order in the deck list; that can still be done with the up and down buttons. I want to say thanks to Frank Walsh for originally proposing the idea about Force Pile, Reserve Deck, and Used Pile to me. I think everyone would agree that it's one of the improvements in Holotable lately. On another note, versions of Holotable and Holodeck for Linux are in the works. If you run Linux and are interested in having a version for your particular flavor, please e-mail me and let me know. I've uploaded a preliminary version of Holotable 0.4.1. Make sure you've got 0.4.0 installed, then download and install the Holotable 0.4.1 (prelim) update. I've fixed a few bugs that were still in the network code. They were probably responsible for the occasional card that wasn't flipped correctly for both players, not being able to see the other player's cards, card sync errors, etc. I've also added, as requested, a button in the options dialog that will restore the default table size, window size, and server IP and port number. Also, the table size auto-adjust feature should now work when using the central server for games. As a side note, I will be unavailable for the next week or so because I'll be on vacation. Hopefully 0.4.1 will solve most (if not all) of the major problems, crashes, etc. The central server still has some problems with locking up, which I will work on when I get back. Enjoy! Oops. I accidentally deleted the updated executable I had posted in the link below. I don't have the same file with me at the moment, so instead I've uploaded a better version that I've been making changes to. It will be the preliminary 0.4.1 after a few more fixes. On that note, I believe I've fixed the server bugs that were causing it to crash so often. It has been up since yesterday evening with 14 games played and no crash. Before the fix it probably would have crashed ~6 times over that many games. Hopefully I haven't spoken too soon and it will continue to work correctly. As always, let me know if you can't get to it or something goes wrong while you're playing a game on the server. As another point of good news, I think I've found the bug that was causing intermittent problems with cards being flipped for one person and not the other. The fix will be in preliminary 0.4.1, which I plan to release later this week. Finally, for those of you who are trying to use Windows 98, I was successful in making Holotable run on my old Windows 98 machine over the weekend. So it can be done. If you have problems, ask for help and I'll try to help you get it working. If you've been having trouble with card sync errors in 0.4.0, download a new Holotable executable and overwrite your old one with it. This may cut down on the card sync errors. From the investigating I've done, it looks like GTK may be giving incorrect data that the code uses to send card updates. If that's the case, I will have to rework the code that figures out where cards are. Please let me know if this fixes things for you (e-mail or on the forums). If you still have problems, I need to know that, too, obviously. Just make sure that whoever you're playing against has this version (it is not in any of the installers). At last...it's here! The final version of Holotable 0.4.0 is released, along with updates for Virtual Set 9 (including large images). Check out the downloads section to get all the goodness. Special thanks go to micokeman3, Rogue4, and rookie for their work on the Virtual Set 9 updates. The only thing I did was make sure their changes all worked together correctly. I am aware of card sync problems that some people have had with the preliminary version of 0.4.0. Some people have had no problems, so I'm not sure what's happening. The final version has some better reporting about what's going on. If you do see a card sync error, please send me the "log.txt" file that is generated. If it's too big to send, let me know that you had a problem so I'll know the frequency of the issue. The log file is overwritten each time you open Holotable, so make sure to send it before you play again. Unfortunately, we do not yet have everything together for Virtual Set 9 updates. I am moving today and will not have Internet access from home until sometime next week. I will, however, have access from work, so it's possible that if everything comes together, I could release Holotable 0.4.0 along with updates for Virtual Set 9 at the beginning of the week. We'll just have to see, though. If you're interested, you can download a preliminary version of Holotable 0.4.0 from the download area. I'd like for some people to try it out and give some feedback, particularly people that have been experiencing crashes. Among the changes I made was a fairly extensive rewrite of the network code, which should make Holotable considerably more stable when connected to another player. I also put in some logging so that, if it does crash on you, you can email me the "log.txt" file so I can try to track down what exactly happened. If you want to know what other changes there are, download it and see. :) A concise list is in the readme.txt file that will be updated when you install. 0.4.0 is NOT compatible with earlier versions. So don't try to play a game with someone who hasn't updated. Because of the above, you might want to make a backup of your old Holotable.exe so you can switch back if you want to play with an earlier version. It has always been important, but I want to reemphasize that you need to have the playing surface size set to the same values. To prevent problems, if you find that you have to change sizes to match your opponent, you should make the change, then restart Holotable. I also want to reemphasize the importance of making sure the table is clear of all cards before connecting to your opponent. After connection, one person should load his deck, then the other person should load his. If you try to load at the same time, it's pretty much guaranteed that you'll get errors. This is a preliminary version. I will be making a few more changes and tweaks to things before it becomes "official". But I do want your comments if you try it out. On another note, the server has been having connectivity problems the past few days. Hopefully the ISP will get a clue and get it straightened out. If you can't reach the site or central game server, just try again later sometime. Version 0.1.2 of Holodeck is released today. It will now "zoom" images when the cursor is placed over the thumbnail on the right. On startup, Holodeck reads the holotable.ini file to get the initial setting on whether you want to use "zoom" or not. There is a checkbox on the main window that will allow you to turn it on or off independently of the Holotable setting (it won't write to your holotable.ini file). Additionally, the three main areas of the window are now resizable with the use of panes (just like you can change the hand area size in Holotable). Finally, there was a problem where Holodeck would crash if you pressed a key while the focus was in either the "select from" or the deck lists. Now that doesn't happen, and you can press 'a' to add a card from the "select from" list or increment the number of a card when it's selected in the deck list. While in the deck list, 'd' will delete one copy of the selected card, and the up and down arrows change the order of cards in the deck. Version 0.3.1 of Holotable is released today. The main added feature is the ability to "zoom" images instead of seeing the text from the CDF file. When this option is selected and an image for a card is available, the large image will be shown in a popup window. A keyboard reference window was added, and the hand count for each player is shown in a status bar at all times (so you don't have to use a key command to check). Enjoy! Holotable 0.3.0 is out! It supports a server lobby, which allows users to chat with and find other players for a game. Currently it is only available as an update to 0.2.2, so if you don't have Holotable at all, you'll need to download and install 0.2.2, then download and install the update. In the next week or so there will be a full installer, which will also include virtual card image updates and CDF file corrections. Version 0.3.0 is not yet available for those of you using GTK 2.4. That should come soon as well. When you have 0.3.0 installed, make sure to change your username (in Table->Options). Also, the port number for the server that supports the lobby is 5320; it's already changed in the updated options file you'll get from the installer. The old server will still be available for a while on 7935. It is compatible with 0.3.0, in the case that you want to play someone on it. The server on 5320 is not compatible with versions older than 0.3.0! I've made good progress on implementing a server lobby that will allow people connected to it to chat and choose their opponent (rather than the current setup of blindly connecting to whoever was the last person who connected and didn't get paired with another user). You will be given the option of accepting or rejecting a game request. Accepting a request will connect you to your opponent (through the server) and close the server chat/opponent selection dialog. You can then load decks and start playing. Look for this feature to be released sometime in the next two weeks! There will probably be a couple of other minor changes, and possibly a CDF and/or card image update. The website has a new look. It'll be easier for us to update, and hopefully is a little more pleasing to the eye. Holotable 0.2.2 is released. It fixes a problem where cards could end up flipped for one player but not the other. It also fixes some of the most annoying flicker related to selecting cards (it isn't all gone...yet...). Enjoy! Sometime soon we'll have updated virtual card images that reflect how the cards actually look. Another tidbit: I updated the Holotable server program. It should be more stable than the previous one. It's been running since Friday (three days ago) and hasn't crashed yet. I'm working on getting Holotable and the server to support displaying users who are connected and allowing the choice of an opponent (along with "chat" for those connected to the server). Holotable is no longer offering "corrected" versions of the SWCCG PC Premium Virtual Sets, as the PC has finally released the "official" ones. You can now get them here. In other news, LtPage2 is currently working on another update for Holotable. Hopefully it will fix a variety of issues people have been experiencing. Visit the forums for the most up-to-date information. Version 0.2.1 is available. Go to downloads for updated installers (as well as solutions to a couple of common problems). Holodeck (screenshot) is now included in the installers available on the downloads page. It includes definition files updated for virtual set 8. The images available in the second installer have been fully tested with these definition files; combining other CDF files with these images (and vice versa) will result in missing images and possibly program crashes. Additionally, the forums are now working. A Deck-making utility (known as Holodeck) is currently in the works. Expect general release shortly. Also, the forums are going to be operation very soon (hopefully). Then you can get help installing/using Holotable. (Until then, just e-mail us with questions). Please remember to come back and register in the forums after they're up and running! We're still working on getting the most up-to-date cdf files (all typos corrected, etc), and revised card images (new visual distinction for virtual cards). Expect these updates with next version release. Be sure to check the screenshot for a look at Holotable!